Telescopic fork features beefy outer tubes for strength, while slider shrouds help protect the 27mm inner tubes from debris. 220mm hydraulic front disc and rear drum brakes combine for serious stopping power. Zuma’s fuel-injected, 125cc single cylinder, 4-stroke engine pumps out lots of power for its size, using an SOHC 4-valve head with 10:1 compression ratio and ceramic-composite cylinder plating. For reliability and easy maintenance, simple wet-sump lubrication is used. 125cc 4-stroke engine with 4 valves, a 10:1 compression ratio, ceramic-composite cylinder plating, and electronic fuel injection gives this Zuma excellent performance. There’s room for two atop this Zuma’s seat, and lots of locking storage beneath it. 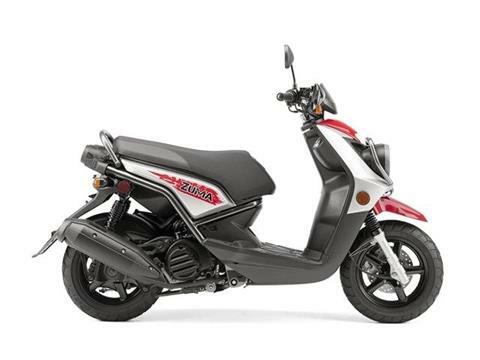 The Zuma 125 achieves fuel economy up to an estimated 89 mpg** with a fuel tank that holds 1.6 gallons of gas.